Watch three TVs at once on the Smart Wall AV | What Hi-Fi? 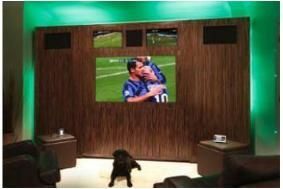 But having seen what home installation company The Pleasure Home has done with the Smart Wall AV, and with the World Cup in mind, we have to say we're tempted. Billed as 'the ultimate home entertainment media wall', the Smart Wall AV boasts three TVs within a hefty chunk of AV furniture. The model shown features a 60in TV and two smaller sets above it allowing your eyes to multi-task until you, perhaps literally, can't see any more. But that's not all, there's a Blu-ray player, Internet and email access, 980 watts of amplification, integrated speakers, a fridge/freezer and a host of yet more optional extras. The model featured costs a cool £39,995 but with myriad features available, if the idea appeals it's probably best to head over to the Smart Wall AV website and start pricing up your dream TV wall.